The right boots for hiking at the Grand Canyon are essential. We cannot stress enough how important good quality boots are to your safety, wellbeing and enjoyment while you’re hiking The Grand Canyon. Over the years, we have heard and could share with you horror stories of how people have suffered because of improper footwear, especially on long hikes and hikes that have significant elevation changes, such as the Grand Canyon. The fact is that as a Grand Canyon adventurer, you are undertaking an adventure that few people ever experience. As such, your enjoyment depends on you having comfortable feet throughout your adventure. And that starts with wearing the proper footwear. Here we’ve outlined how to fit, purchase and maintain the proper footwear. Additionally, at the bottom of the page is a list of links that will provide you even more detailed information. Please keep in mind that there is no “best brand” for socks or boots. There isn’t a specific combination of socks and boots that work well for everyone. Let your feet be the judge, and get the right hiking boots for The Grand Canyon! Hiking The Grand Canyon requires supportive hiking boots. Hiking sandals, sport sandals, walking shoes, trail running shoes and “rugged” walkers are not hiking boots and not appropriate for hiking The Grand Canyon. We recommend and prefer you to wear over the ankle supportive hiking boots, but ankle-high boots will suffice. Your socks and boots work together to keep your feet comfortable throughout your training and hike day. Whatever store you choose, you will find a multitude of socks to choose from. There are a number of factors to consider when buying socks. First, there’s price. Next is the material and construction. Should you go with wool or a synthetic material, such as acrylic, Coolmax, Thermax or some other type of polyester? Or a natural fiber such as wool or cotton? Our personal favorite is Smart Wool brand. Don’t cheat your feet! While there are a multitude of brands available on the market today that are great for hiking, none of them come in the form of tube socks on sale three pair for $5.00 at a swap mart. 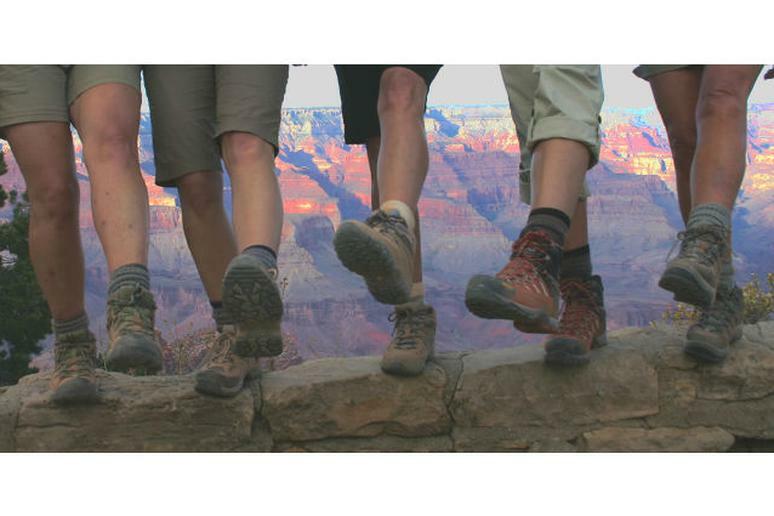 Your training and ultimately, your experience at The Grand Canyon depend on you having comfortable feet. It is better to purchase one or two pair of high quality socks and wash them frequently rather than numerous pairs of cheap socks that cause blisters. If your feet get cold easily go with wool. Wool has the best insulating ability, yet it still wicks sweat away from your feet effectively. Socks made of “merino” wool tend to be softer and are made with finer fibers than regular wool. We do not recommend cotton socks. They tend to trap moisture which softens the skin on your feet making them much more susceptible to blistering. As for synthetics, they are great if your feet are on the sweaty side or if you are training in damp conditions. They do a better, faster job of wicking away that moisture. Consider this: During a regular day, your feet perspire up to one cup (240ml) of moisture. Yuck! Don’t trap it in your shoes! Next check the density of the fabric; the denser the better. Turn the sock inside out and inspect the fabric loops that make up the bulk or padding of the sock. The smaller, tighter and denser they are, the more cushioning they will have over the long haul. The bigger the loops, the more likely they are to lay down over a long hike, so smaller loops are best. Next, test the thickness of the socks. Not in boots, but as they feel by themselves. If you like how they feel now, then you will probably like how they feel later. Construction and Fit: Look for flat, unobtrusive seams that won’t gouge into tender, trail-worn feet. Strong elastic is a good thing. It can help prevent your sock from bagging or slipping. As for fit, a sock should be a bit snug, but not so tight that it feels constricting. As you pull the sock on, make sure your heel fits neatly in the heel pocket. Then check to see if it’s smooth and snug around the toe. Even the slightest bit of bagginess means you should go down a size. In taking care of your hiking socks, always wash them inside out to remove dead skin and sweat buildup where it counts. Use a liquid fabric softener during the wash cycle, but use it sparingly. Too much can result in a slick, oily feeling, but just the right amount will keep your socks soft and cozy. Anyone who tells you that “you should buy [insert your favorite company name here] brand boots” doesn’t know what he or she is talking about. On the flip side of the coin, anyone who asks “Which brand of boots should I buy?” is asking the wrong question. The best boot for you, and the one you should buy, is the one that fits your foot. It’s really pretty simple. If it doesn’t fit your foot in the store, you shouldn’t buy it. A particular brand may work great for your friend’s foot, and he or she may think it is the best boot on the market, but if they blister or cramp your feet or need to be “broken in,” they are the wrong boot for you. Why doesn’t your friend’s boot work for you? Because your friend doesn’t have your feet. You may listen to their recommendation and it may be a valid place to start shopping, but treat it as that…just the beginning. There are a number of factors to consider when buying boots. First, consider price, next is purpose, then material, weight and construction. Most important of all is fit! First consider price. Again, don’t cheat your feet. The truth is, a good pair of boots is going to cost a bit more money in the beginning. Cheap boots cost less to start, but ultimately, what is the price you will pay? When shopping for new boots, we would recommend that you stay away from “discount shoe store” boots. Boots here can simply be enhanced versions of street shoes. They “look” rugged, but they’re probably not going to feel very good down the trail and even worse coming back up. Shop at a reputable outdoor shop that specializes in hiking and backpacking equipment. These shops generally carry well-designed outdoor footwear for the hiker. Keep in mind when shopping for boots that you will require “dual” purpose boots. Many of you will be preparing for your hike in wet and muddy conditions, maybe even some snow or ice and water-resistant or waterproof boots may be appropriate. At The Grand Canyon, weather conditions are less of a factor, but terrain (rocky, steep and uneven) and boot weight are more important. Water-proofing is not a factor. The materials used in any given boot or trail shoe will affect its weight, breathability, durability and water-resistance. Boots made of different fabrics can be very similar in performance, however, personal preference is often the key when choosing between them. Lightweight Hiking : These boots are designed for day hiking and very short overnight trips only. They stress comfort, cushioning and breathability. As a result, they are less supportive and durable than a heavier weight boot. Mid-Weight Hiking: These boots are designed for on- and off-trail hiking with light to moderate trekking. They are more durable and supportive than lightweight hiking boots, but they are still intended primarily for short to moderate trips over easier to moderate terrain. Combination Nylon Mesh & Leather: Nylon and leather boots are lightweight and breathable, which makes them perfect for warm to moderate weather. They are very good for day hiking in moderate climates. They can be softer on your feet and as a result your feet get use to them faster. They are most always lighter than full-grain leather boots. They also cost less. They tend to be less water-resistant than full leather boots but there are styles that feature waterproof liners that can be just as water-tight. These are best suited for The Grand Canyon. Full Leather: Full leather is extremely water-resistant, durable and supportive. There are lighter models available that are suitable for day hiking. For harder terrain such as the more technical aspects of The Grand Canyon, these boots are well suited. They do tend to weigh more than the nylon mesh and are not as breathable. As well, they often come with a harder sole and therefore take your feet a while to get used to. 1) Good boots are solid on the bottom (stiff last). If you can press in the bottom of the sole with your thumb, the soles are probably too soft to give your foot proper protection. Avoid bruising the bottom of your feet. You shouldn’t be able to feel rocks or stones through the soles. If you can it is likely that after many miles on the trail, your feet are going to start hurting. 2) Good boots provide good ankle support. The top of the boot should be stiff to hold the ankle in place and provide it with good support. These are the type boots we strongly recommend. If you choose to wear a lower cut boot, you will obviously have less support. While these are not recommended, they are acceptable, but you must take the responsibility to train and build strength in your ankle so they are less affected by rocky, uneven and rough terrain while hiking long distances up steep inclines. 3) Good boots match their intended use. A “lighter” boot used for day hiking may not have the necessary rigidity to provide your feet with good support under the heavier load of a backpack. Once you have decided the type of boot you want, choosing the right fit is the next challenge. In the store, don’t let the appearance of a boot, the salesman’s recommendation, or the brand name of the boot convince you to buy a boot that won’t work for your foot. In making your selection be sure the design has sole rigidity and ankle support you want. Then, using the exact socks you plan to hike in, start trying various sizes. Testing the Forefoot of the Boot: With the boot fully unlaced, slide your foot in the boot and move it as far forward in the boot as possible. If the boot is the proper size for your feet, you should be able to slip your index finger down inside the boot at the back of the ankle along your heel. Your finger is just about the right size to help determine if that all important extra space is available in the front of the boot when you lace them up. The extra space is needed when walking down the steep declines of the Canyon. Testing for Pressure Points: Make sure your socks are stretched smoothly over your foot, not loose, which can cause the sock to fold over when you slide your foot into the boot. Lace the boots up. They should not feel tight in any area. As well, they shouldn’t feel loose in any area either. If the foot still feels jammed (or inversely, loose), look for another boot. The Long Walk Test: Next, wear your boots around the house to experience how they feel throughout the day. Lounging on the couch doesn’t count. The longer you wear them (inside so you don’t scuff up the bottoms), the better feel you will get for how they might treat you while on the trail. If they still feel good, you’ve found a reasonably good boot for your foot. If they don’t feel good, take them back and keep looking.